With the continuous development in the medical field, potential certified nursing assistants can expect excellent salary packages in the future. According to the U.S. Bureau of Labor Statistics (as of May 2013), the mean annual and hourly CNA salary in Arkansas was $21,280 and $10.23, respectively. 18,150 certified nursing aides were working in the state (in May 2013) with employment ratio of 15.75 per 1000 jobs. As per the data provided by indeed.com, the average CNA income, in December 2014, was $25,000, which was 2% higher as compared to the national average salaries for these job postings. Based on different percentile brackets, here are the per annum wages of certified nursing assistants. 90% of CNAs made less than $27,720; 10% made more than $27,720. 75% of certified nurse assistants earned less than $23,620; the remaining 25% earned more than $23,620. 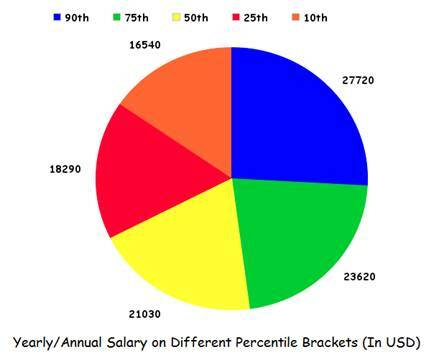 50% of the employees earned less than $21,030; the rest of 50% earned more than $21,030. 25% of nursing assistants were paid annual wages less than $18,290; 75% were paid more than $18,290. 10% of employees were offered less than $16,540; 90% were offered more than $16,540. There are a wide number of factors that can affect the salaries of a CNA in the state of Arkansas, such as educational background, location, and the industry. Among the various cities, Jonesboro was the highest paying city for this profession with median annual salary of $22,733 and median hourly salary of $11. Maximum number of cities paid median hourly salary of $10. The median per month income of nurse aides fluctuated from $20,614 to $22,733. The lowest paying cities were Bentonville, Fayetteville, Rogers, and Springdale. There are a number of positions, which can be acquired by a CNA. Each job title has its own specific benefits, requirements, responsibilities and duties. As of December 2014, as per indeed.com, the highest income in the state was reported to be of CNA Hospice, with an average annual salary of $32,000. Followed by them were Medical Assistant Family Practice and CNA Rrmc, with average income of $30,000 per annum. The salary of Correctional Prison Facility CNA was $15,000, which was the lowest than what other professionals with similar titles earned. Like other U.S. states, Arkansas also has a positive growth rate for CNAs. Nursing assistants’ jobs are projected to grow by 21% between 2012 and 2022. Increasing number of elderly patients and escalating rate of chronic conditions are some of the reasons that will lead to a large number of job openings for these professionals. Overall, the potential nurse aides can expect a bright future in this field of nursing. Question 1 – Which are the highest paying cities for nursing assistants in the state of Arkansas? Answer – According to salary.com, Jonesboro was the highest paying city for CNAs in December 2014. The city paid median annual, monthly, weekly and hourly salary of $22,733, $1,894, $437, and $11, respectively. Question 2 – What is the average salary that a nursing assistant can expect in Arkansas? Answer – In AK, CNAs can expect an average annual pay of $25K (according to the indeed.com).